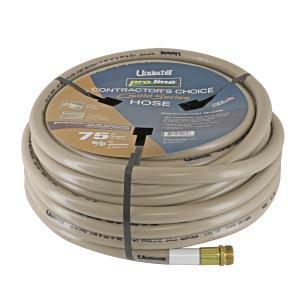 Underhill ProLine Gold Garden Hoses are a great choice for homeowners and landscapers who want a quality lightweight garden hose at an affordable price. The tough outer TPE cover, with reinforced spiral synthetic yarn core is made for day-to-day use, is crushproof and has durable machined brass hose end connections. Compatible with any of our standard 3/4" hose thread garden hose spray nozzles.